There are many good area's off the San Jacinto North Fork. Most of the good area's are hard to get too, that's what makes them good, otherwise they would be fished out and full of rainbow's. 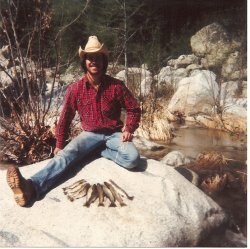 Here's a pic on the North Fork between the 243 and the 74, we actually packed in and stayed the night right on the river. Look at the spread of browns on the rock, all caught in one day. This was in April of 1981, I don't know if this can be done anymore. Happy hunting for those good spots. The North fork is a fun place to fish! But even more exciting is the South fork. This area is not for the beginer or novice angler! Its a very trechorus hike of about 4 miles from the parking area on Highway 74, it starts off uphill for about 1/2 mile then its downhill all the way, coming back out is 3 1/2 miles of uphill. When you reach the creek (this is the drainage out of Hemet Lake) you can go up or down river. I recommend going up, the fishing tends to be a little better. However, after the spring run off, the river can grow pretty narrow and small with some deeper holes, focus on these holes. The fish in here are native Brown Trout and are very very jumpy! They can be very big but stunted in growth (short stalky body and a big hook jawed head). The brush around the creek is thick and you might have to do some rock hopping. DO NOT venture down here during summer!!!!! It is very hot and there are tons of rattle snakes!!! Try this spot in fall, the browns are spawning and very hungry, or early spring. Bring water and be in good physical shape. There is one other access point, you can park before the parking area and hike down Suicide Hill (less than half the hike of the normal trail), but this way is evebn harder, 3/4 mile down hill at an 80degree angle, its a hand over hand climb out!!! Good luck! !